He just asked Abraham to do a very hard thing. Sometimes it is hard to know why God does the things he does. We may never know. But we know two things. God loves us more than we will probably ever know. And there is not even the smallest smidge of bad in him. God cannot do anything mean or evil. God could no more do anything evil than a banana could ride a bicycle. It's just impossible! Here I am, Abraham said. What was God thinking? How could he ask Abraham to do such a thing? Remember, Abraham had waited a long, long time for his son Isaac. It seemed impossible that he would ever even have a son. But God had promised, and God kept his promise. Now was God going to take his only son away? But God had also promised that from Abraham would come as many children as there are stars in the sky. That must have been what Abraham kept telling himself early the next morning when he went to gather wood for the sacrifice. God always keeps his promises, he must have told himself over and over. Abraham bundled the wood up and put it on his donkey, and then Abraham, Isaac, and two of Abrahams servants set out on the way God had directed them. After walking for three days, Abraham looked up and saw the place where God was leading him. Abraham said to the two servants, Wait here with the donkey while Isaac and I go to worship God. Then he took the wood for the sacrifice and laid it on his son Isaacs back. Imagine, Isaac had to carry the wood for his own sacrifice. Many, many years later, Gods own son would have to carry the wood for his own sacrifice. Then, it would be the wood of the cross. Yes, my son, Abraham said. That question must have nearly broken his fathers heart. But, God had promised Abraham that through him many people would be blessed. And God always keeps his promises. God will provide the lamb, Abraham said. He probably didnt even know what he was saying. He didnt understand, but he trusted God. The two walked up the mountain in silence. Abraham couldnt have loved his son more. How hard that walk must have been. When they got to the top of the mountain, Abraham built an altar. He laid the sticks of wood on the altar, and then he tied his son with rope and laid him on the wood. His heart was breaking. Still, he trusted that God was good. He couldnt understand why he had to sacrifice his son. He only knew that God had commanded it. Do not harm your son Isaac, the angel said. And Abraham put down the knife. Just then Abraham saw a ram tangled by its horns in a nearby bush. Here was the animal for his sacrifice. 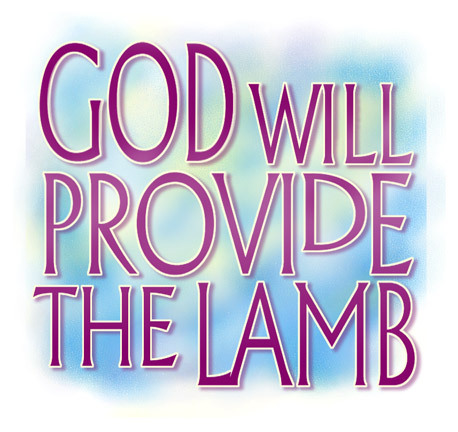 God HAD provided the lamb - just like Abraham said he would! But, why did God ask Abraham to sacrifice his only son? It was part of Gods plan. God commanded Abraham to sacrifice his son Isaac for us. Because Abraham obeyed God, when we hear this story we can just begin to understand what it must have been like for God when he sent HIS only son Jesus to die on the cross for us. How hard that must have been for God. God knew that Jesus would be like the ram Abraham found caught in the thorny bushes (remember, Jesus had thorns around his head too, just like the ram in the thicket). When Jesus died on the cross, he took the punishment for our sins. He took the punishment for all the bad things we will ever do. God sent Jesus to take our place just like he sent the ram to take Isaacs place. And here is the amazing, wonderful thing. Because God was willing to sacrifice his only son for us, and because Jesus was willing to die for us - we are blessed. Everyone who believes in Jesus will live with him forever. God provided the lamb to save Isaac's life. Jesus is the lamb God has provided to save our lives! What at first seems so terrible, turns out to be the most amazing, wonderful thing. God HAS provided the lamb!